The widespread cliché of Jamaica is that of a country with an easy-going, laid back lifestyle and slow pace (apart from its short distance runners, of course). Well, this could not be further from the truth when it comes to Reggae music. Even avid and dedicated followers of the scene might have problems keeping up with all the releases, events and gossip the Reggae industry creates. Especially the dancehall fraternity produces incidents and headlines on a daily basis that even a soap opera author could not think of. 2011 was no exception. Reggaeville did its best to inform you about what happened in Reggae all over the world. We travelled to dozens of concerts and festivals to shoot photos, collect live footage, conduct interviews or produce reports. In 2011 alone we provided more than 400 live videos, 75 video interviews and 85 album reviews for you, we published the first ever comprehensive digital festival guide, the „Festiville 2011“ magazine. But it is like in school: The more you learn the harder it is to remember everything. Or can you recall who won the Reggae Grammy in 2011? The month Buju was sentenced? The exact color of Vybz Kartel’s skin? Which Reggae greats left us? The day Sizzla had his severe accident? Fortunately, in the days of internet you do not have to keep all of this in mind. You just need the „Reggaeville Yearbook 2011“. 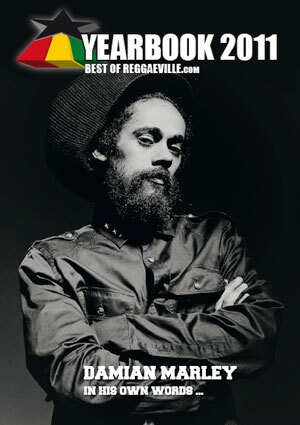 In this magazine we collected all the highlights of 2011 for you to enjoy again by conveniently and easily surfing through the Reggaeville online archive. We also asked several of our favorite performers to tell us about their special moments of the year. And we sat down with Damian „Gongzilla“ Marley to discuss his review of 2011. Of course, there has to be a Reggaeville album of the year, too. About 30 of our photographers and authors voted their Top10 album releases of 2011. Guess you might be curious about the result of our intern poll. And although Buju says: „I could go on and on, the full has never been told“, the „Reggaeville Yearbook 2011“ is quite close to the full story. A story Reggaeville will keep on documenting in 2012. Have a peaceful, prosperous and musically rich 2012!